We understand that water leaks and seepage are common issues when working with water-retaining structures or when building below ground. 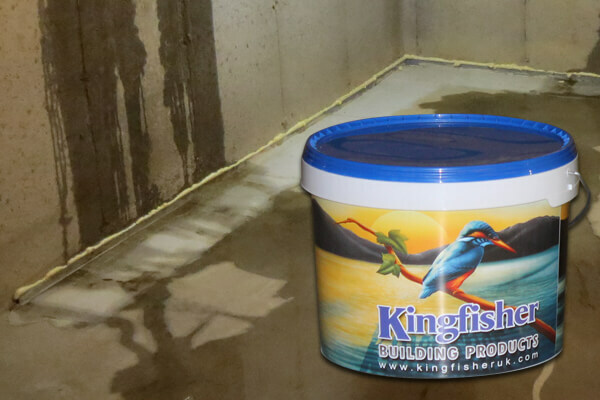 That’s why we developed the Kingfisher Tank Plug – Water Plugging Compound, one of the best water plug sealants on the market today. We have a wealth of experience supplying and manufacturing cementitious waterproofing slurries, ensuring a high-quality product. Our Water Plugging Compound can be used internally and externally, providing an outstanding water tight seal. Perfect for cementitious damp proofing, this water plug sealant is fast setting and second to none for patching and plugging water leaks and seepage. It can be used for many applications, from concrete and masonry walls to foundations and retaining walls. We have tested this product in a wide range of environments, so you can rest assured of its durability and quality. We have an enviable reputation for providing the highest quality water plug sealant. We had a hairline crack in the render on the outside of the basement wall. I followed the instructions raking out the crack and filling this with the water plugging compound. It was a slow process, not necessarily because of the product but as always with leaks the water finds another area of least resistance to it so you end up applying more compound to a larger area. The product itself has worked and the leak has now stopped. I would view this as a temporary measure and will be looking to have the wall rendered with Kingfisher tanking slurry in the near future. The compound is probably easier to use and more immediately effective when plugging an actual hole in the render as opposed to a small hairline crack. The ordering process was very simple I ordered it on line on Sunday evening and it arrived on Tuesday as promised. I would be happy to use Kingfisher products again.